* Grilling; how else are you supposed to make dinner during the summer? * We got a new gnome for our collection! * S'mores bars, simply delicious. * Getting creative with cupcake frosting. * Homemade brown sugar = so much better than store-bought. * I got my hairs cut! Although, this isn't news to anyone anymore, really. * Reese's Puffs marshmallow squares... why are sticky treats so much better during the summer? * Mushu just loves the camera! Look at that face. * A semi-healthy meal, for good measure. Fresh vegetables! * Bamboo has a pretty face too, he wants you to know. 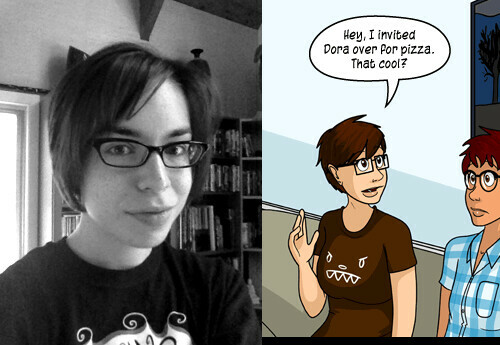 And last but not least, this amuses me; I've been reading the web comic Questionable Content for years (seriously, at least 8 years now...) and my recent haircut + my glasses make me look like Faye, one of the main characters. Can't say I'm not a fan! Also, the shirt I'm wearing is one of his designs.